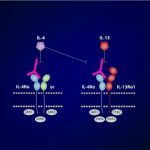 Dupilumab–New Era for Bad Eczema? Eczema (often referred to as Atopic Dermatitis, or AD) is a terrible disease. The relentless itch, continual skin breakdown, poor sleep, cracked and painful skin that can become infected: all of these are part of daily life for those with more severe eczema. The quality of life indices for this disease show that day-to-day suffering exceeds that of many other chronic conditions considered much more dangerous. In children, it is recognized as the gateway to asthma and food allergies—the so-called Atopic March. It turns out that it is an incredibly frustrating disease for health care practitioners as well. While more conventional approaches include supplementing a deficient skin barrier with moisturizers and wet wrapping, using corticosteroids to calm inflammation, and applying anti-bacterial medications to fight staphylococcus, numerous unconventional therapies such as from soaking in the Dead Sea to weaving silver thread into clothing have been tried. With limited options, and medications that often have significant side effects, many patients remain under-treated and continue to suffer. The dream of patients and providers alike–aside from preventing it in the first place or a total cure, of course!–is a medication that would work quickly to calm the itch and inflammation, to truly allow the skin to truly heal. It would do so safely, without toxic side effects to the liver or kidneys and without an increased risk of cancer and infection. It would be easy to use instead of greasy creams or cumbersome wraps. Finally, it would not simply suppress the inflammation, but would help block the escalating itch-scratch cycle and not result in a rebound flare up when stopped. Thus far, we have not had a medication like this at all for AD. Frustratingly, however, the somewhat similar skin condition psoriasis has had excellent medications very similar to this for over a decade, complete with TV commercials. If the studies are to be believed (and I’m pretty hopeful they are), in the next few months, something close to our dream may finally be realized for AD. Dupilumab is a medication that is currently under review and is awaiting approval by the Food and Drug Administration (FDA). It is composed of monoclonal antibody–proteins that are part of our immune system normally– and, as such, is sometimes referred to as a “biologic”. 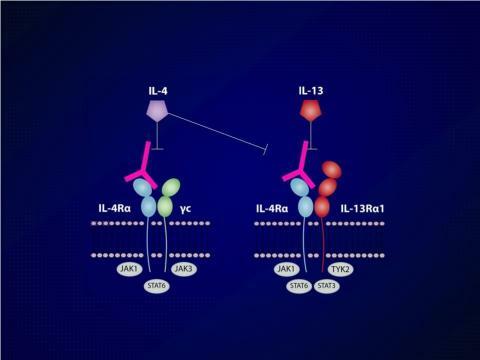 It is specifically designed to bind to (and thus inhibit or block) two important chemical messengers in the body: interleukin-4 (IL-4) and interleukin-13 (IL-13). These messengers, called cytokines, are very important in that they seem to be overproduced in eczema. Their message, in large part, seems to be: “Make more inflammation and itch! Make an allergic reaction!” Thus, it follows that by very carefully quieting them down, the resulting eczema quiets down. Perhaps most importantly, it does so WITHOUT shutting down the entire immune system or poisoning the body. How good is it? Well, the most recently completed studies are very promising. Published in the well-respected New England Journal of Medicine, two recent randomized and placebo-controlled trials in adults with moderate to severe AD found that nearly 40% of the patients were clear or almost clear at the 4 month-visit. And the vast majority of the treated patients had measurable improvement, even if they were not clear or nearly so. Importantly, there were no serious adverse effects, and the patient satisfaction and quality of life gains were very impressive. What are the downsides? Well, it’s still not approved yet, so it remains unavailable for now. In the short run, it will only be approved for adults with moderate to severe AD, leaving out the vast majority of AD patients (children) for now. However, there is some good news on that front. Unlike the monoclonal antibody, Xolair, which was approved by the FDA for children age 6-11 only in July 2016, 13 years after approval for ages 12 and up, dupilumab is also going to be tested early for pediatric patients. Indeed, my own center may take part in those trials. Then there is the question of cost, which will always be an issue for these highly engineered biologics. Although we don’t know the price, similar medications used in psoriasis are very expensive, and I expect this to be similarly priced. As a benchmark, a year ago, the price for Nucala, a brand-name version of mepolizumab, an IL-5 inhibitor for asthma, was announced at $32,500 for 12 injections. Finally, dosing. As an injection, it requires a shot every other week, which makes it a tough sell for some. Xolair seems to be a “forever” treatment for asthma, and while some dupilumab patients show signs of deep remission, allowing for discontinuance after their skin heals, there is reason think that most will require ongoing therapy in order to stay clear. This is still not a cure, unfortunately. With luck, however, this will represent a new era for AD: incredibly effective and safe medications to help end the suffering. What a welcome addition that would be! 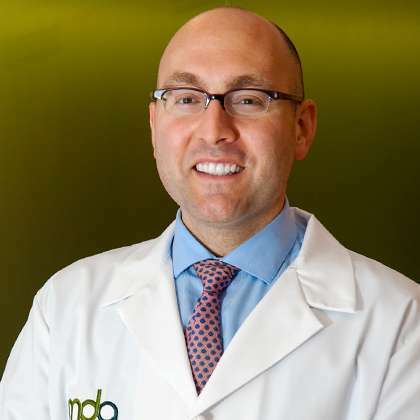 Peter A. Lio, MD is an Assistant Professor of Clinical Dermatology & Pediatrics at the Northwestern University Feinberg School of Medicine, and a Diplomate of the American Board of Dermatology. Dr. Lio received his medical degree from Harvard Medical School, completed his internship at Boston Children’s Hospital and his dermatology training at Harvard. He served as a full-time faculty at Harvard (Beth Israel & Children’s Hospital Boston) from 2005-2008 before returning home to his native Chicago to join Northwestern and Children’s Memorial Hospital. He is also a trained acupuncturist and a leader in the Chicago integrative health care community. This is an awesome article! First clear explanation of what it does and how it does it, and with such empathy and respect for the seriousness of the disease from a practitioner. He had me so hopeful even as I knew how inaccessible (cost wise) it would be. Wow! Great article! Thank you so much. I’m so excited about this medication, and think it could change my life. My son needs this medication. Can an allergist give me this prescription, or does it need to be a dermatologist? Unfortunately, this medication is still in the clinical trial phase. You might try reaching out to Regeneron for information.